Tu es devant moi dans la queue. Tu es avant moi dans la queue. You are in front of me in the queue. You are before me in the queue. NB: Sometimes in English you can use both 'before' and 'in front of' in a sense of space. 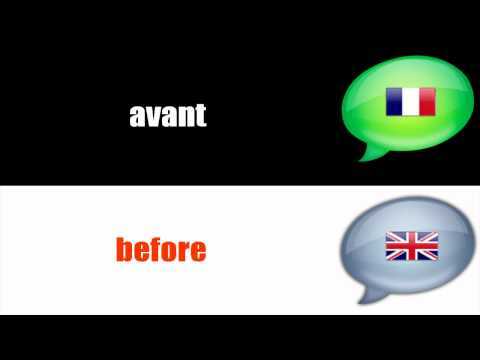 In these cases in French, you can only use devant as it is the space-related preposition. Mon frère est assis dans la rangée devant moi. My brother is sitting in the row before me. My brother is sitting in the row in front of me. Je me tiens devant lui. I stand in front of him. In this example, the English translation seems like the present tense ... "is sitting". But "assis" is the past participle for the verb s'asseoir / to sit. How would this be described gramatically, or why not use l'imparfait or present tense? Also is this grammatical usage of a past participle "seated", unique to the verb s'asseoir? Thank you. Mon frère est assis dans la rangée devant moi.My brother is sitting in the row before me. Hi Robin, in French "to be sitting" is expressed as "to be seated". And seated is also a past participle. Elle était aimée. -- She was loved. Je me tiens devant lui - I stand before him??? Replying to myself. I have seen this use of se tenir before now. Is this typical? "Je me tiens devant lui." is pretty common (according to a native French speaking friend of mine) among adults, less so among teens. So if devant is the opposite of derrière, what is the opposite of arrière? Bonjour Dzoan, I had to look this one up in the Collins-Robert Dictionnaire to ensure what I was thinking was, indeed, the antonym of arrière. There are two possibilities listed: avant devant So dependent of the context of how the word would be used, it could be either. Bonne chance. What is the meaning of "Nous sommes avant vous dans la queue."? time:	avant (before) space	devant (in front of) So given the use definitions in the lesson, I am unclear the reason that «avant» is used relative to queue. To me queue is an indication of space as opposed to time. Please explain. It means "We are in front of you in the line" Hope this helps! A queue is also, by it's nature, a line of people waiting for something. Who is going to get to the front of the queue in less time? The people speaking are in the position of having joined the queue earlier than the other person. Thus they are going to get served before (in time) than the other person, as well as being before the other person actual terms of physical space. Hope this helps. Bonjour Ron ! "Nous sommes avant vous dans la queue." is considering the queue from the angle of the length of time it's going to take, and therefore means "We come before you in the queue" in the sense of "We'll be served before you". I hope that helps! À bientôt ! In French, you can consider both angles: you could also say ""Nous sommes *devant* vous dans la queue. ", in which case it's your geographical location. The nuance is minute here :) Bonne journée ! Merci, Aurélie, C'est très clair.